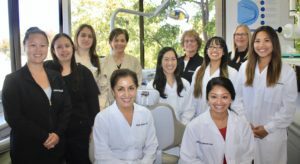 Foster City Dental Care is a private, general dentistry practice established in 1996. Our highly experienced staff of Dentists and Registered Dental Assistants are friendly, understanding and helpful. We are dedicated to making you feel as comfortable as possible while providing you with the best possible dental services available. Our beautiful, modern office is expertly equipped to handle all of your family’s general dentistry needs. We use quick, low-radiation digital x-rays, and we also have intra-oral cameras so you can see what we see. For those that need a little extra encouragement we offer nitrous oxide gas. We encourage you to ask questions and to participate fully with us in your treatment planning. Helping you be healthy and get the smile you’ve always wanted is our #1 goal. We care for both adults and children so your entire family can be seen at one location. Our expert Staff will help you with appointment and insurance details. We’ll do all the paperwork necessary to ensure that you get the most from your dental insurance coverage. Whether you’ve been fearful of visiting the dentist or just haven’t had the time, it’s not too late! Contact us today, you’ll be glad you did! Farsi, Mandarin, Cantonese, Tamil, Tagalog, Spanish, and Vietnamese.